Every once in a while a product comes along that intrigues me and finds its way into my home for a review. 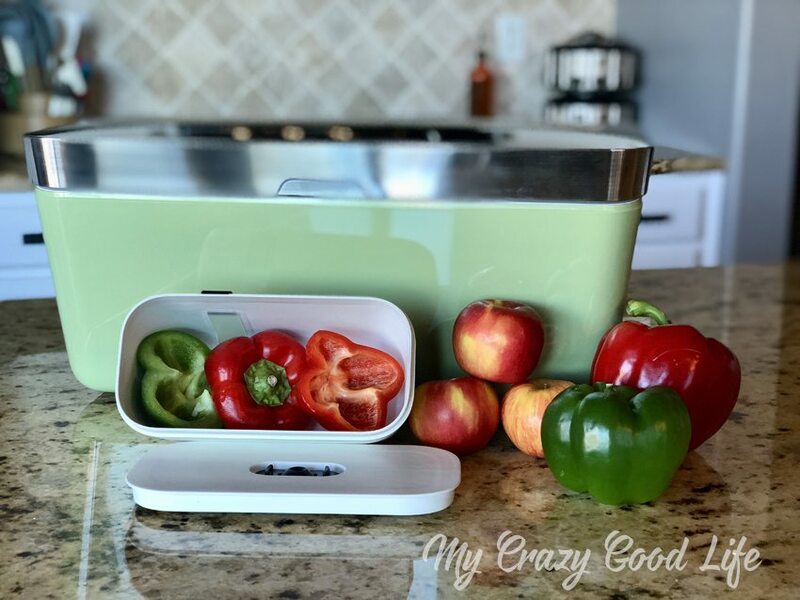 This food storage system, the Vacuvita® One Touch Storage System, is one that I knew you all would love as much as I do because after all of the meal prepping that we do, who wants to waste food? Vacuvita sent me a unit to review and test in exchange for me sharing my honest thoughts about it in this review. Vacuvita is a food storing, marinade infusing, sous vide prepping machine. It’s a vacuum storage for the modern age! There are colors, sizes, and organizational elements that make this system great for the home chef. Many people don’t know that air is actually the main culprit when it comes to spoiled food. 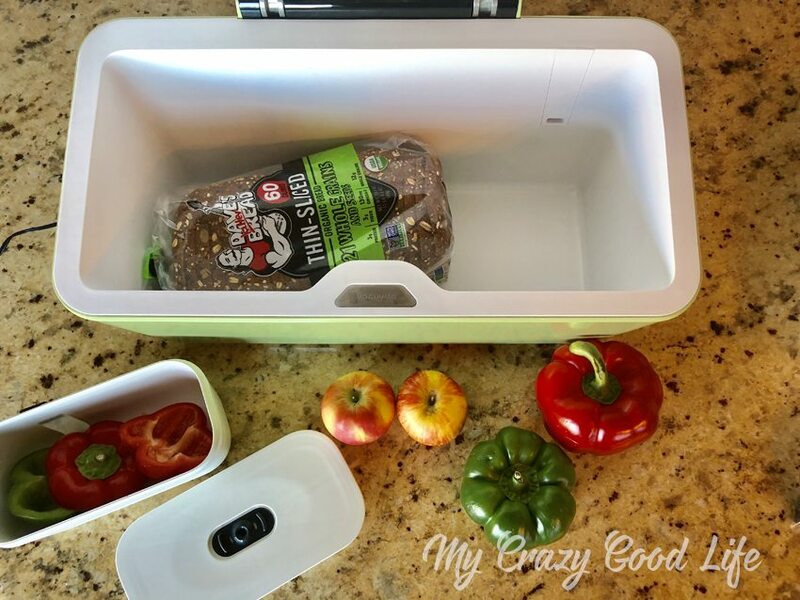 A system like Vacuvita is excellent at storing and saving leftovers and meal prepped items. Not only does it organize and beautifully store your favorite foods, it can also help keep them fresh. The Vacuvita Food Storage System is a money saving investment! You can keep fresh foods and leftovers tasting great for up to 5x longer with Vacuvita. By removing all the air from the containers and packaging there is less chance for food spoiling bacteria to grow! The average family wastes about $1300 worth of food every year because it spoils before it gets eaten. 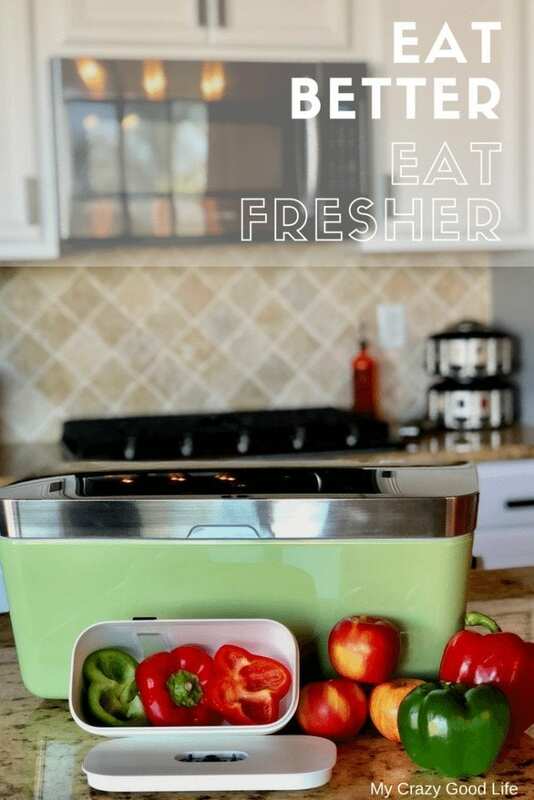 If you could make your fresh produce, leftovers, and meal preps last five times longer would that help you throw less away?! Vacuvita is also great because it comes in some fun colors and designs. The system itself is beautiful. It’s not a eyesore like some food storage systems. There are five gorgeous colors to choose from so you can match them with your current style, kitchen needs, or decor. Like some other food storage vacuums, Vacuvita can vacuum seal plastic bags. This means you can use it to prep foods for sous vide cooking! You’ll be wowing your friends and family members with some of the tastiest meals ever! What’s different about Vacuvita is that it also vacuum seals containers. They come in matching (or complementary) colors and in three different sizes. You can order them in 1 quart, 2 quart, and 1 gallon sizes. This allows you to do so much more with your Vacuvita. Storing fresh produce is easy, quick, and possible! With other systems the produce would be crushed, now you can seal it inside one of the beautiful Vacuvita containers and keep it fresh until you are ready to cook it into your next masterpiece. What Else Can Vacuvita Do? The Vacuvita system comes with an optional mobile app. You can download the app and scan the QR codes that come with your containers and bags to track when you store foods, what is inside, and more. The app will actually help you figure out how long you can safely keep items inside and alert you before they go bad. Talk about helpful! Marinading like a master chef is simple and fast thanks to the Vacuvita containers. You can seal up your meat in the marinade and the vacuum seal will help infuse the flavors, lightening fast, into your meats. Now your grilling skills will be undeniable, start practicing now for all those backyard BBQ’s this summer! You can check out this link right here for unique recipes, tips, tricks, and more. Vacuvita is always sharing amazing and delicious recipes that you can create with your very own Vacuvita system. When storing bread products in your Home Base container, leave it wrapped in paper or plastic. Do not store both dry and moist foods in Home Base at the same time, because the moisture will transfer from one product to the other. Wash, clean and dry fresh fruits and vegetables before vacuum sealing in bags. The drying is a really important part. Win a Vacuvita for yourself! Leave a comment below and let me know what you would do with a Vacuvita One Touch Storage System! For an extra entry, head over to my Instagram and comment on my Vacuvita post there–be sure to come back and leave another comment telling me what your Instagram username is so I can find you if you win! All entries will be eligible to win, and the winner will be chosen on April 15, 2018. I would use this to keep all the fresh food longer! I hate wasting food! I will use it for all of the prepping and saving I have to do for the 21fix for my daughter, husband and myself. I am a teacher. Wake up at 4:45, go to my teaching job, get home at 5:30pm and we then make supper. After supper, we prep for the next day. This would free up some prepping time during the week. This is intriguing. I like the container idea! I am constantly tossing food because there’s only two of us in the house. We can never seem to eat all of our produce and leftovers. This would a huge money saver for us! I would love this to store my berries and vegetables so I could buy in bulk and make less trips to the store. 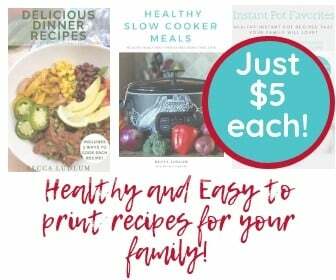 Save money on gas and less food loss! This is such a wonderful concept. I’ve used other vacuum sealed products but the bags were not always conducive with what I was packaging. 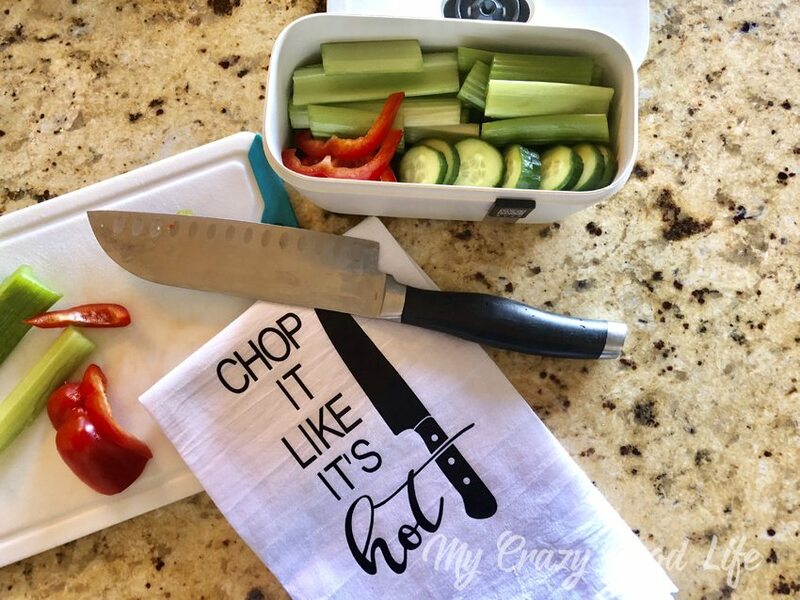 21 day fix meal prep would be even easier! I would love a system like this. I have 4 kids that I pack lunches for and my husbands lunch everyday. I feel like I’m at the grocery store all the time buying bread, veggies, and fruit. It would be so nice to have a system like this that helped keep food fresher longer. Commented on IG as well. This system looks amazing. I would love to use those containers. I would use the Vacuvita One Touch Storage System for all my fresh vegetables from our garden.